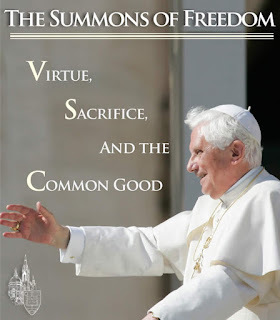 I just returned from "The Summons of Freedom" conference hosted by the Notre Dame Center for Ethics and Culture. It was, as always, a marvelous gathering of scholars and students. Again as always, it was a welcome opportunity to visit with my fellow presenters, some of them old friends, and to meet many new friends. I am especially grateful for extended conversations I had with my friends Fr. Michael Sweeney, president of the Dominican School of Philosophy and Theology in Berkeley, and Pat Fagan of the Family Research Council and others. It was a rare treat to hear from Alice von Hildebrand and Michael Novak, each an example of how faith can ripen in a long life, endowing a person with a hint of the aura that scripture says surrounded Moses when he came down from his encounter with the Lord. I had a brief chat with Michael Novak and a more extended one with Alice von Hildebrand, and I will treasure the memory of each. Another highly was meeting Lucy Beckett, a British scholar, novelist, and historian whom I have lately been reading. Like Michael and Alice, she is the incarnation of the truth to which she gave witness. It was an inspiration to be in her presence. So I return to my desk with great gratitude for the community of faithful and joyful people with whom I shared a few days -- a bit exhausted, but more than a bit inspired.